Bring on the hate! (which gets *ahem* moderated but those vFanboys will attempt to post anyway). Matt McSpirit of Microsoft did his now regular comparison of the latest versions of Microsoft Windows Server 2012 R2 Hyper-V and VMware vSphere 5.1 at TechEd NA 2013 (original video & deck here). Here are my notes on the session, where I contrast the features of Microsoft’s and VMware’s hypervisors. Before we get going, remember that the free Hyper-V Server 2012 R2, Windows Server Standard, and Windows Server Datacenter all have the exact same Hyper-V, Failover Clustering, and storage client functionality. And you license your Windows VMs on a per-host basis – and that’s that same on Hyper-V, VMware, XenServer, etc. Therefore, if you run Windows VMs, you have the right to run Hyper-V on Std/DC editions, and therefore Hyper-V is always free. Don’t bother BSing me with contradictions to the “Hyper-V is free” fact … if you disagree then send me your employer’s name and address so I can call the Business Software Alliance to make an easy $10,000 reward. If you want to compare like with like, then the free Hyper-V crushes the free vSphere hypervisor in every way, shape, and form. The max VM numbers per host are a bit of a stretch. But interestingly, I did encounter someone last year in London who would have used the maximum VM configuration. Storage is the most expensive piece of the infrastructure and that has had a lot of focus from Microsoft over the past 2 releases (WS2012 and WS2012 R2). In the physical world, WS2012 added virtual fibre channel, with support for Live Migration. MPIO is possible using the SAN vendor’s own solution in the guest OS of the VM. In the vSphere world, MPIO is only available to the most expensive versions of vSphere. VMware still does not support native 4-K sector disks. That eliminates new storage from being used, and limits them to the slow RMW process for 512E disks. In the VM space, Microsoft dominates. WS2012 R2 allows complete resizing of VHDX attached to SCSI controllers (remember that Gen 2 VMs only use SCSI controllers, and data disks should always be on a SCSI controller in Gen 1 VMs). In the vSphere world, you can grow your storage, but that cloud customer doesn’t get elasticity … no shrink I’m afraid so keep on paying for that storage that you temporarily used! ODX is supported in all versions of Hyper-V (that’s the way Hyper-V rolls) but you’ll only get that support in the 2 most expensive versions of vSphere. That’ll slow down your cloud deployments, e.g. VMM 2012 R2 will deploy VMs/Services from a library via ODX and we can nearly instantly create zeroed out fixed VHD/X files on ODX enabled storage. Both platforms support boot from USB. To be fair, this is only supported by MSFT if it is done using Hyper-V Server by an OEM. No OEM offers this option that I know of. And VMware does offer boot from SD which is offered by OEMs. VMware wins that minor one. When you look at file based storage, SMB 3.0 versus NFS, then Microsoft’s Storage Spaces crushes not just VMware, but the block storage market too. Tiered storage is added in WS2012 R2 for read performance (hot spots promoted to SSD) and write-through performance (Write-Back Cache where data is written temporarily to SSD during write activity spikes). Memory overcommit: closest to Hyper-V Dynamic Memory as you can get. However, DM does not overcommit – overcommitting forces hosts to do second-level paging. That requires fast disk and reduces VM performance. That’s why Hyper-V focuses on assigning memory based on demand without lying to the guest OS, and why DM does not overcommit. Transparent Page Sharing (TPS): This deduping is not in Hyper-V. I wonder how useful this is when the guest OS is Windows 8/Server 2012 or later? Randomization and large page tables make render this feature pretty useless. This deduping also requires CPU effort (4K page deduping) … and it only occurs when host memory is under pressure. Hyper-V does do Resource Metering, and presents that data into System Center (Windows Azure Pack and Operations Manager). VMware does make the data more readily available in a simpler virtualization (versus cloud) installation via vCenter. vSphere free does not present this data because there is no vCenter, whereas that data is gathered and available in all versions of Hyper-V.
Network QoS is a key piece in the converged networks story of Hyper-V, in all editions. You’ll need the most expensive edition of vSphere to do Network QoS. Before the vFanboys get all fired up, WS2012 R2 (all editions of Hyper-V) adds Storage QoS, configurable on a per virtual hard disk basis. vSphere Enterprise Plus is required for Storage QoS. Cha-ching! Don’t give me guff about number of partners; WS2012 Hyper-V had more network extension partners at RTM time than vSphere did after years of support for replacing their vSwitch. So, we keep the Hyper-V virtual switch and all of its functionality (such as QoS and HNV) if we add 3rd party network functionality, e.g. Cisco Nexus 1000v for Hyper-V. On the other hand, the vSphere vSwitch is thrown out if you add 3rd party network functionality, e.g. Cisco Nexus 1000v for vSphere. The number of partner extensions for Hyper-V shown above is actually out of date (it’s higher now). I also think that the VMware number is now 3 – I’d heard something about IBM adding a product. DVMQ automatically and elastically scales acceleration and hardware offload of inbound traffic to VMs beyond core 0 on the host. Meanwhile in VMware-land, you’re bottlenecked to core 0. On a related note, WS2012 R2 leverages DVMQ on the host to give us VRSS (virtual receive side scaling) in the guest OS. That allows VMs to elastically scale processing of inbound traffic beyond just vCPU 0 in the guest OS. IPsec Task Offload is still just a feature on Hyper-V for offloading CPU processing that is required for enabling IPsec in a guest OS for security reasons. SR-IOV allows host scalability and low latency VM traffic. vSphere supports Single-Root IO Virtualization, but vMotion is disabled for those enabled VMs. Not so on Hyper-V; all Hyper-V features must support Live Migration. BitLocker is supported for the storage where VM files are placed in Hyper-V, including on CSV (the Hyper-V alternative to clustered VMFS). In the VMware world, VM files are there for anyone to take if they have physical access – not great for insecure locations like branch offices or frontline military. Live Migration will be compressed by default, using any available CPU on the involved hosts, while prioritizing host/VM functionality. With RDMA enabled NICs, you can turn on SMB Live Migration. This is even quicker by offloading to RDMA, and can leverage SMB Multichannel over multiple NICs. Neither of these are in vSphere 5.1.
vCenter has DRS. While Hyper-V does not have DRS and DPM, we have to get into the apples VS oranges debate. System Center Virtual Machine Manager (the equivalent + MORE) of vCenter does give us Dynamic Optimization and Power Optimization (OpsMgr not required). Storage Live Migration was added in WS2012 Hyper-V. I love that feature. Shared-Nothing Live Migration allows us to move between hosts that are clustered or not – I hear that the VMware equivalent doesn’t allow you to vMotion a VM between vSphere clusters. That seems restrictive in my opinion. All versions of 2012 R2 Hyper-V allow us to do Live VM cloning. For example, you can clone an entire VM from a snapshot deep down in a snapshot tree. DevOps will love that feature. Network Virtualization was added in WS2012 R2. Yes, the real world requires VMM to coordinate the lookups and the gateway. While third party NVGRE gateways now exist (F5 and Iron Networks) WS2012 R2 adds a built-in NVGRE gateway (in RRAS) that you can run in VMs that are placed in an edge network. The VMware solution requires more than just vCenter (vCloud Networking & Security) + has the same need for an NVGRE gateway. Ideally (not everyone though because of the cost of storage/redundant hosts), you want your hosts to be fault tolerant. This HA is done by HA in vSphere (paid only) and Failover Clustering in Hyper-V (all versions). Failover Prioritization, Affinity, and NIC teaming are elements to be found in vSphere and Hyper-V.
With CAU, you don’t care that MSFT does a great job at identifying and fixing issues on a monthly basis. The host update process is quick and automated, with no impact on the business. A Hyper-V cluster can scale out way beyond that of a vSphere cluster. Not many will care, but those people will like having fewer administration units. A Hyper-V cluster scales to 64 nodes and 8,000 VMs, compared to 32 nodes and 4,000 VMs in vSphere. HA is more than a host requirement. Guest OSs fail too. Guest OSs need maintenance. So Hyper-V treats guest clusters just like physical clusters, supporting iSCSI, Fiber Channel, and SMB 3.0/NFS shared storage with up to 64 guest cluster nodes …. all with Live Migration. Meanwhile vSphere supports iSCSI as long as you use nothing newer than W2008 R2 (16 node restriction). Fibre Channel guest clusters are supported up to 5 nodes. Guest clusters with file based storage (SMB 3.0 or NFS) are not supported. Ouch! Oh yeah … Hyper-V guest clusters do support Live Migration and vSphere does not support vMotion of guest clusters. There goes your flexibility in a vWorld! Host maintenance will impact tenant services in vSphere in this case. Sounds like VMware might be better here? Not exactly: you lose vMotion and memory overcommit (their primary memory optimization) if you use Shared VMDK. Ouch! I hope too many tenants don’t choose to deploy guest clusters or you’re going to (a) need to blur the lines of physical/virtual with block storage or (b) charge them lots for non-optimized memory usage. Both Hyper-V and vSphere have built-in backup and VM replication DR solutions. In the case of 2012 R2 Hyper-V, the replication is built into the host, rather than as a virtual appliance. Asynchronous replication is every 30 seconds, 5 minutes or every 15 minutes in the case of Hyper-V, and just every 15 minutes in vSphere. Hyper-V allows A->B->C replication whereas vSphere only allows A-> replication. With HNV, a company can pick and choose where to place their services, and even elements of services, in this hybrid cloud. Hyper-V is tested at scale more than any other hypervisor: it powers Windows Azure and that’s one monster footprint that even Godzilla has to respect. Are my techies vFanboys and their preferences are contrary to the best needs to the business? Is the consultant pushing vSphere Enterprise Plus because they get a nice big cash rebate from VMware for just proposing the solution, even without a sale? Yes, this is a real thing and VMware promote it at partner events. I think I’d want an open debate with both sides (Hyper-V and vSphere) being fairly represented at the table if I was in that position. Oh – and all that’s covered here is the highlights of Hyper-V versus the vSphere hypervisor. vCenter and the vCloud suite haven’t a hope against System Center. That’s like putting a midget wrestler up against The Rock. Oh wait … why not check out Comparing Microsoft Cloud with VMware Cloud. He quickly moved on to other topics, but those 2 simple sentences revealed a paradigm shift AND an opportunity. Aidan, I would love to see a version of this article targeted at the CIO level. It would have to be short, sweet, and vHate removed. (After all, the CIO must feel his VMWare choice was ‘right at the time’, and now his next smart business move is to choose Hyper-V.) I’d love to pair it up with Gartner’s Magic Quadrant (is there a 2013 version?) to show Hyper-V is enterprise-ready. I am OK with VMWare. It is good technology. But, it’s difficult to explain that VMWare is not the only viable solution, and there’s a real (monetary) cost to the business that could be avoided. We use Hyper-V 2008R2/2012 & System Center 2012 in our environment. – Spelling my name correctly. I’m working in IT for 14 years and never posted a question on a blog before because there is great resources online like yours to answer most common design scenarios but I’m stumped on one scenario for Hyper-V 2012 R2 along with Replica and Systems Centre Orchestrator. I’m working on an implementation of hyper-v where there is Live an DR physical site with 4 hyper-v hosts on each site along with an independent sans running in each site along with a windows failover cluster in both locations. Setting up replica is easy a but I want to use System Centre Orchestrator to manage the failover and failback. Clouds are used within SCVMM in the primary site to separate tenant VMs with different owners and these need to be able to failover separately in groups. I read your post on orchestrating failover but my question is around the placement of the System Centre VMs in Live and DR and if I should install SCVMM and System Centre Orchestrator in the Live and DR site. I was thinking if I had installs on each site I could use the live site to manage the failover and use the dr site to manage the failback or lastly by having system centre only in the live site and replicating the System Centre VMs over to DR and bringing them online manually to get the management platform up and running again in a DR situation. – The simplest might be to treat each site as a different System Center “domain” for SCVMM and SCORCH. – You could have a single install in the primary site and replicate it to secondary site via HVR. First steps would be to manually failover those SysCtr VMs but there would be noise about the missing production site that is supposed to be managed. – You could create a stretch SCVMM cluster but that’s more pain that one might want. – Or you could run SysCtr just from the secondary site, but have problems when the DR link goes offline (which it will from time to time). The hosted orchestration solution, Hyper-V Replica Manager, uses the first option. That is the problem you will see over and over. No matter how much sense it might make to look at Hyper-V some techs and even managers don’t want to change no matter how good it is for the company. Time and time again if the Hyper-V vs VMware discussion is brought up VMware guys like to pull up comparisons from years ago so it is nice to see something current. Because it’s a 1990s tech!?!?!? I’d just like to point out that Windows 2012 supports native NFS 4.1, so looks like you’ve spent a lot of $$$ on VMWare Licenses. Any shares created on storage server can be presented simultaneously over SMB and NFS. I’ve been looking into deploying VDI across our organisation for some of our apple users. We have a vSphere setup so of course I’ve looked at VMware View and XenDesktop. While I had some spare machines I put together a VDI based on Hyper-V (All 2012 R2 based) and quite impressed so far. I have access to SCVMM and 2012 R2 DC and looking at how much I need to pay a year for my vSphere license, going pure Windows is going to save money, or at least put money into improving other services. I wouldn’t say I’m a vFanboi, but over my career I’ve always have VMware systems (ESXi, Fusion, Workstation) but I like to use whats best for the purpose and while vSphere has fit that purpose just fine but if we just stick to what we know then we’ll never learn anything new. Hi Aidan – nice post. We have been on Hyper-V since the WS08 days and are now happily cranking along with WS12R2. You just can’t beat the licensing gains by running Datacenter on your hypervisors. I have a question regarding secure multi-tenancy in a Hyper-V WS12R2 environment. I’m specifically looking for documentation regarding security at the hypervisor level. I don’t mean Hyper-V networking — there is lots of information available addressing Hyper-V networking and the extensible switch. I’m more concerned about features that can avoid things like VM breakouts (i.e., compromise of the hypervisor from an owned VM) or “cross VM” owning at a hypervisor level. Aside from many blogs and KB articles citing the requirement for DEP (which is also lacking in up-to-date and Hyper-V-relevant documentation), there is nothing that I can find which speaks to the security of multi-tenancy, while leaving out the virtual networking discussion. I suppose I qualify as a vFanboy since I really didn’t feel Hyper-V 2008 was ready for primetime. I’ve heard good things about 2012 R2 (beyond all the information you provide here), and we will probably start testing soon. 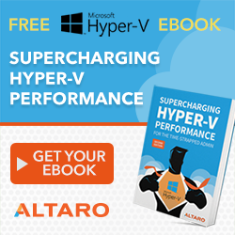 But there is an important area that seems to be left out of this discussion, one that impacts our ability to switch entirely to Hyper-V – vendor support. Cisco in particular only allows for vSphere deployments, and only using their supplied ova files. I haven’t heard anything to tell me they plan to change their policy any time soon. Uhhhhh Cisco is a BIG Hyper-V partner. My biggest SOFS install has been on a site with Cisco UCS rack and blade servers. I know of one partner in Switzerland (Thomas Maurer, MVP) that LOVES the combination of UCS and Hyper-V. And Cisco Nexus 1000V has a completely supported extension for the Hyper-V virtual switch. Hi Aidan, thanks for the article and detail. I sat through a presentation by a team within my company who gave VDI a very hard sell, and have based the solution on VMware. When I asked why they said Windows is not there yet – they only use RDS. Vmware has 5 or 6 ways of presenting applications. vSphere still has numerous advanced features that Microsoft has yet to imitate. and their own end-user computing suite for desktop virtualization. Again I don’t have the background to verify these points. I see Hyper-v lacks hot-add CPUs but found a blog who explained you can overcommit anyway. Do you have any answer to counter these claims? (NB: I am looking for facts; the guys ruined their presentation by exaggerating issues of thin vs thick, so am trying to understand WHY they, and indeed the company seem sold on VMware when Hyper-v 2012 has so much to offer (and yes, 2016 too now!). fault tolerance > chocolate kettle. It sounds great but you cannot use it in the real world. Google the limitations of the feature. built-in agentless VM backup software with deduplication > I can backup VMs on my Hyper-V hosts just fine, without putting agents into the VMs. a disaster recovery planning and testing software offering > Azure Site Recovery works great with Hyper-V and vSphere for site-to-site or site-to-Azure DR (replication/failover and/or orcehstration), and it’s half the price of VMware’s offering. load balancing for storage performance and capacity > System Center does this (WinServ + SysCtr is less than vSphere), and WS2016 does it natively without SysCtr (RAM/CPU). Ask them what about their native HCI performance? Do they still need to use SAN for performance? Do they have native RDMA support for storage and vMotion? Can they push VM movement at 20 Gbps or faster? 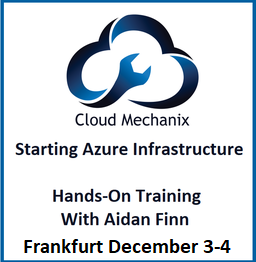 Do they have a consistent cloud offering, that includes modern application deployment methods such as containers and secured (Hyper-V) containers? What exactly is the public cloud that VMware offers that is consistent with the on-prem solution? Hmm? Oh – and Microsoft’s VDI for scale solution is Citrix – the unquestioned market leader. Anyone who disagrees with that either works for VMware or made the mistake of just buying VMware’s VDI products.